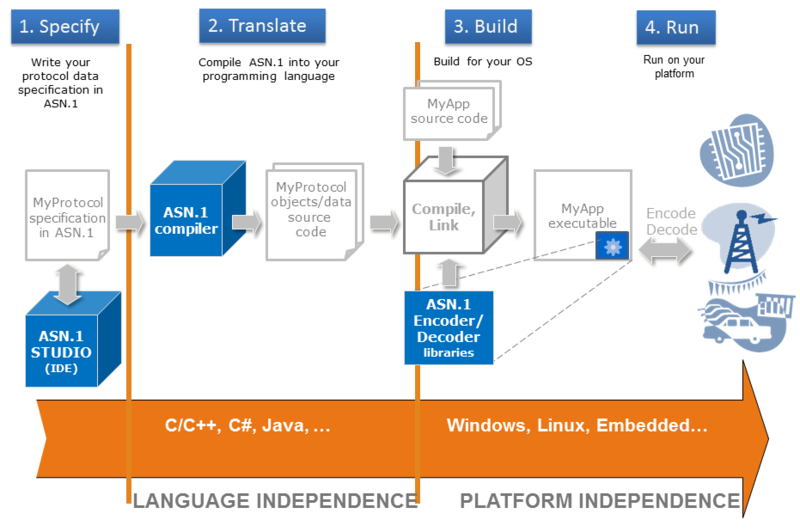 The OSS® ASN.1 Tools for C is a complete development toolkit for rapidly building applications using ASN.1. This product features a powerful ASN.1:2015 capable compiler, a runtime library with ASN.1 BER, CER, DER, PER/UPER, CPER/CUPER, OER, COER, XER, CXER, E-XER, and JSON encoder/decoder engines, and a rich collection of utilities to simplify and speed your development. Our ASN.1 products support LTE Advanced Pro including NB-IoT, C-V2X and LTE-M. OSS products will support the 3GPP 5G specifications which will be released in 2018. The compiler takes ASN.1 specifications as input, and generates C language data structures plus control tables for encoding and decoding. The OSS compiler offers extensive diagnostic capabilities to minimize your development time and effort. A set of runtime libraries provides ASN.1 encoding and decoding functions and valuable auxiliary functions to operate on application messages. The OSS runtime libraries have been ported to 500+ platforms, including many embedded platforms. If you need high speed encoding/decoding and the smallest possible memory footprint, look no further. Simply put, the OSS ASN.1 Tools for C are the most optimized ASN.1 tools you will ever find. More information about how to create, compile and link your ASN.1 application using the ASN.1/C Tools. Download the ASN.1/C Tools today!